First 5k postpartum -- check! It was rough, I am so out of (running) shape and my lack of training showed. But, there were a sweet, blissful few moments when I wasn't focusing on how slow I was, or how much it hurt and it reminded me of that rush of running a race and the thrill of just running for the heck of it. I'll get back to loving running someday, right? 8 Walk Zoo; Owen's 1st visit. Grandpa Rex + Uncle Jay came down to spend the weekend with us which was so fun. 13 Rest; head to Detroit! 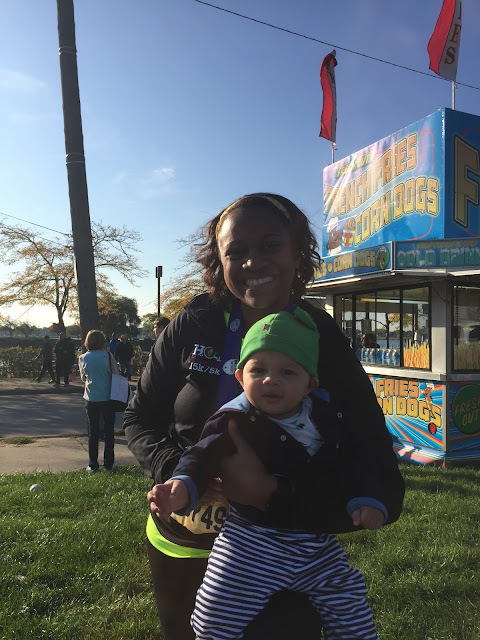 15 1st Postpartum 5k!!! (33:49) -- Jennifer made a sign that was incredible. People kept stopping and asking to take photo with it.